Approximate 1850 artifice. 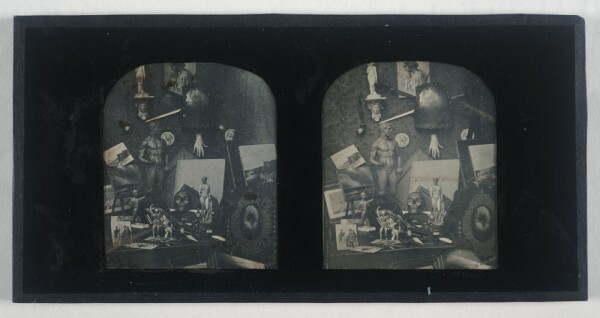 The uses of the stereoscopic trick: you are enlisted in displacing the site of depth perception’s processing from the brain to the outside, to the modern double image. By its doubling, you are enlisted in its presence as the left image that is not-complete, the right image that is not-complete. You are also enlisted in its absence: it is outside [my] brain, its existence not dependent upon [me], it exists in a world without [me]. The category? The artist’s pieces of subjection. Objects as paraphernalia, or “things not under the control of the husband.” These are the other things, the delicious that have no value out of the exchange context. Only perpetual potential value in other, other contexts. The content? An image of objects required by an artist: implied, understood, assumed, uses and activities, histories — not our concern here. The content is a projection of the viewer. The objects used by the artist who is not, at the moment, using them. They are separate objects, just as the two images are separate, without coherence, but all potential. The dismembered hand is represented, the male human form at different scales, the disjoined human form, the gravity-defying human form, the non-physical. The implied non-physical as expressed by multi-scaled representations of the human body. Landscape as the usual stereoscopic cliche, a heart-pounding wild-ness, the soaring attempt at the reclamation of “human-ness.” This image of paraphernalia is Not-Yosemite. This image’s reclamation is simultaneously an invitation to intimate presence (lay your hand in mine, let’s measure this relation together) and a denial of the possibility of participating in this human intimacy as represented in the only way we know how, in the separateness of objects. We must pull ourselves apart in order to recreate our representation. You don’t need to believe the trick of stereopsis. It is good enough to override disbelief in order to engage the desire. And yet, if we focus only on the final product, when we remove a hand, we remove the hands. Two images of related but not identical objects having moved across space and time. Dissimilarity as a matter of scale, of power. The scale of the human body — the measurable distance between the two eyes enabling binocular vision — determines the presentation of the visual imagery. The scale of the human body enables the consumption of the imagery. The double image suspending content’s primacy. Absence of the technology to join the images, absence of the artist to interpret the material. Viewing the image does not require a mechanical viewer but it will not be comfortable without it. Cross your eyes and look at the image. Hold it. Your limits are your discomfort. The limits of the imagery are your discomfort. Diane Ward was born in Washington, DC, and currently lives in Santa Monica, CA. Over the past several decades she has published numerous books of poetry including No List (no list) (Seeing Eye Books); Flim-Yoked Scrim (Factory School); and When You Awake (Portable Press at Yo-Yo Labs). Several of her poems have been set to music by Los Angeles composer Michael Webster. She is currently working toward a PhD in Geography with a focus on artists’ and activists’ placemaking activities in the urban anthropocene.